The world has always abounded with dubious medical advice. Even in our own, “scientific” times, people line up to take our money in exchange for crystals or copper bracelets or magnets that are promised to cure what ails us. In the United States, the Food and Drug Administration evaluates claims of efficacy; and while it’s overworked and highly problematic, at least the most blatant medical frauds do not receive FDA approval. Modern consumers are lucky to have something to go on, at least. The same was not true a century ago. 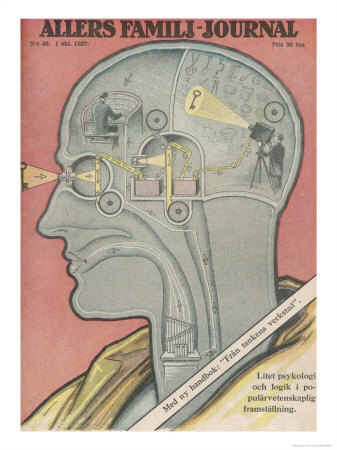 Phrenology, snake oil, and dubious cures abounded, and it was left up to the consumer to figure out which ones were for real — or, in many cases, which ones even contained the ingredients they claimed. It can be fun to look back and see what passed for medical science back in the day. 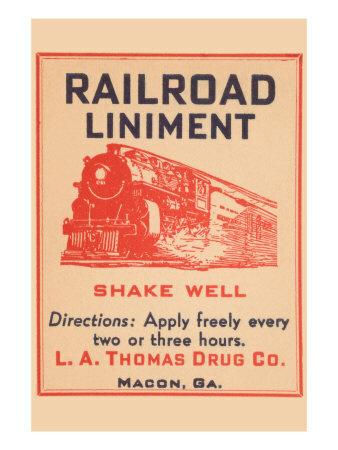 Many vintage advertisements for patent medicines are now being reproduced as posters, and, for those who collect such things, antique medical devices can be found all over the internet. These items make great gifts for history teachers, medical students, or medical professionals who want to remind themselves how far they’ve come. You know. For your brain. 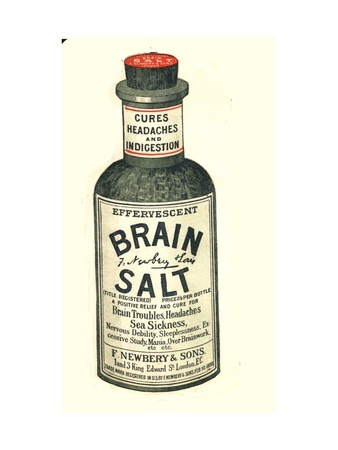 This is one of my favorite vintage medical images: brain salt. For brain troubles. Such as Over-Brainwork, whatever that is. Come to think of it, “Brain Salt” would make a pretty cool name for a band. Symbological AND phrenological? Now that’s what I call a bargain! 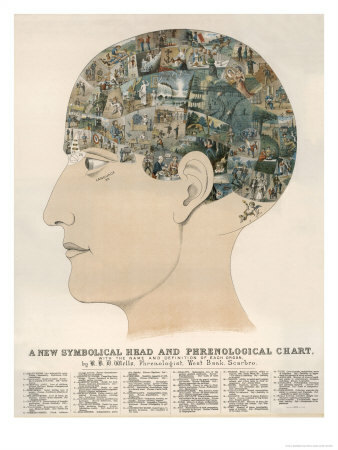 This phrenological head includes a visual guide to the various “organs” of the brain, to assist those phrenologists who are tragic victims of illiteracy. You know I’d love to stick around, baby, but it’s time to move on. Can’t help it. It’s tragic, really … when I was a small child I was dropped on my head, damaging my Organ of Domesticity, and I’ve been a rolling stone ever since. Hey Kids! Measure Your Organ of Veneration! Phrenologists used craniometers to measure the skulls of their subjects. By analyzing every bump, they would then deduce the moral character of the person they measured. Phrenologists used craniometers to measure the skulls of their subjects. By analyzing every bump, they would then deduce the character of the person they measured. It’s pretty easy to laugh at today — the idea that your sense of morality can be determined by measuring your skull. 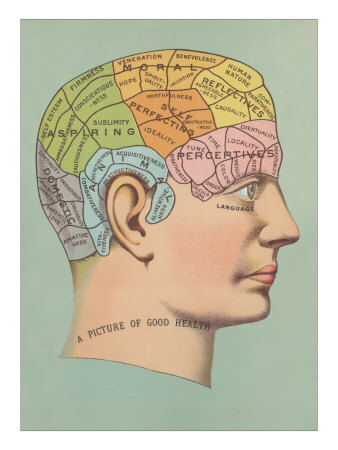 However, phrenology was an important forerunner of modern neuroscience. The assumptions about the skull were incorrect, but the theory was based on the idea that different parts of the brain manage different human qualities and activities. Scientists would later go on to discover that everything from speech to emotional mood is determined by localized areas of the brain. Thanks to the little men inside it. Little did we know, our brains function because of two little men inside, wearing suits (that part is important!) one of whom plays the pipe organ and one of whom runs a film projector. Thanks to them, little arrows trickle down the back of your throat and then back up again. This is why, whenever you see a key, you sing Bach’s Greatest Hits for Pipe Organ. You can’t help it, really. A great gift for the collector, or for that med student in your life! Given that this advertisement is from the UK, “pale people” seems kind of redundant. Not to pick on the British — thanks to my Irish ancestry it takes me five minutes to start burning in the sun. I myself am, indisputably, a “pale person”. 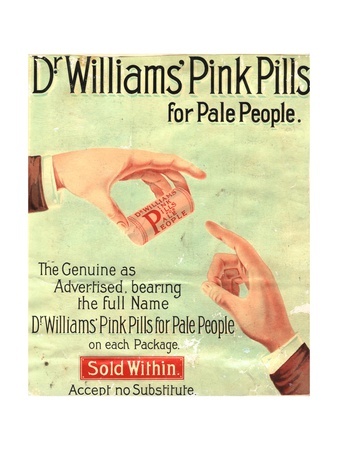 But I love the way these are just “pink pills for pale people” … with no word, anywhere, about what they’re actually supposed to do for pale people. Turn us pink? Allow us to get a healthy tan? Let us leap tall buildings in a single bound? What? Maybe to treat The Vapours? I have often walked by the ocean, wondering what the wild waves were saying. “Look out for that shark?”, maybe. Or perhaps “Here’s a hot stock tip!”. Or more likely, “Stop dumping poison into us already!”. 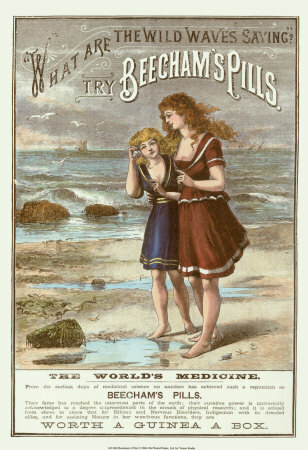 Turns out it was “Try Beecham’s Pills” all along. Who knew? When Your Blood Has That “Not So Pure” Feeling? This seems to be an ad for Dr. Kilmer’s line of herbal remedies. 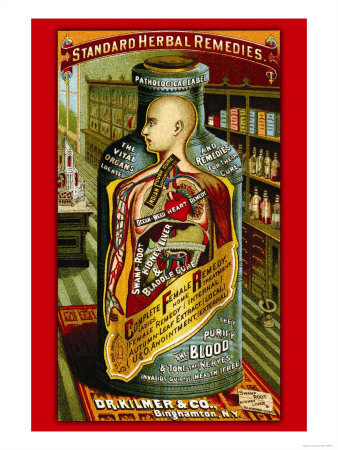 It conveniently shows “The Vital Organs Located, and the Remedies For Their Cure”; and indeed, this is followed by a label over the heart saying “Ocean Weed Heart Remedy”, and another one showing the liver and kidneys saying “Swamp Root Liver, Kidney, and Bladder Cure”. But my personal favorite is the big label that hides the lower abdomen. It reads “Complete Female Remedy. Ladies Home Treatment. 3-in-1 Package. Female Remedy (Internal). Autumn Leaf Extract (Local). U&O Anointment (External)”. 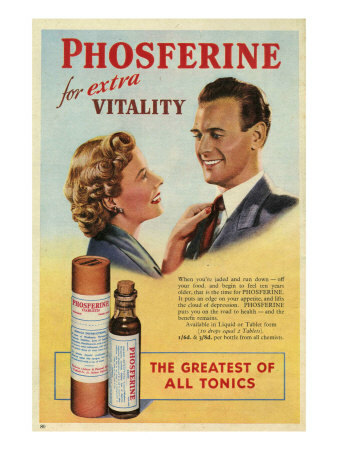 I don’t know what phospherine is, but it apparently improves “vitality”. You know … vitality? Nudge nudge, wink wink, say no more? San Francisco has these cute antique streetcars that they run down Market street. Hard wooden seats. No shock absorption to speak of. In a word, “ouch”. And I’ve only ever ridden them for a few blocks. Give it a thumbs up. 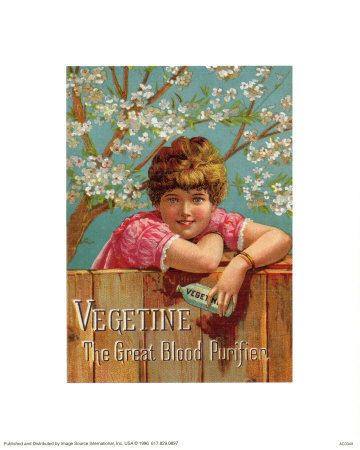 Since you can’t give me Vegetine, for that psychotically wholesome look, at least give me a “FB shar or Fb like”! 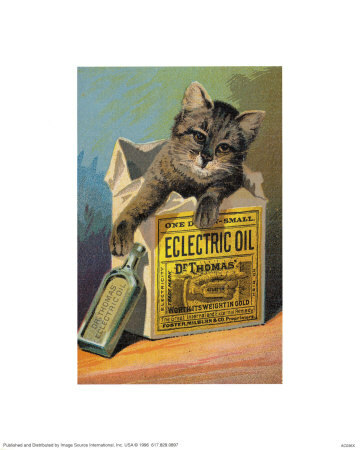 And don’t forget to take your Electric OIl!